One of the most important skills as a woodworker is the ability to sharpen your tools, because lets face it although most woodworkers, myself included really don’t like to sharpen our tools because we would rather be woodworking. Recently while doing a restoration project I needed to research a lot of material on restoring hand tools specifically hand plane and chisels and one of the topics that I needed to learn more about was honing a blade. My head was dizzy after doing some of the research because almost everybody on YouTube or the go to woodworking periodicals that we subscribe to had a different method, did you want to sharpen your blades by hand or use a machine, or a mixture of both. So I decided to create this page and include what I found online and put it in a format that I would understand and possibly aid you as well. This section is basically what I found to be useful and by no means is a method that is better than anyone else. 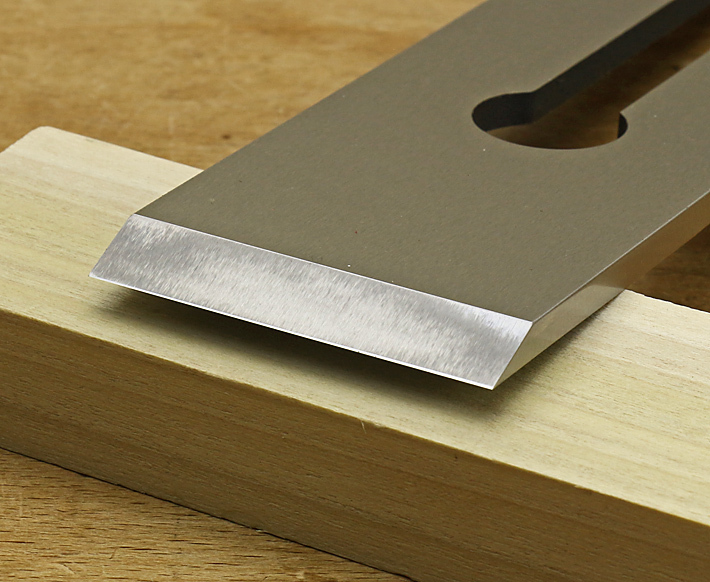 A sharp edge is basically the meeting of two faces of very finely surfaced steel at a narrow acute angle. For plane blades, chisels and most other woodworking tools, the first requirements for sharpening a new tool are to flatten and polish the back. This makes it available to accurately meet the opposite (bevel) face of the tool to create the sharp edge. A high quality tool will come from the factory with a back that is very nearly flat, requiring only modest refinement and then polishing to an extremely smooth finish. On the other hand, one of the prices paid for a cheap tool will be a lot of time and frustration in just these first steps. Once flattened and polished, the back of the blade should require only minimal attention for the life of the tool. The opposite side of the tool has a bevel, generally with two parts. The primary bevel is typically formed at a 25-27-degree angle to the back, while the secondary bevel is usually 3-7-degree steeper. Specific angles are based on the use of the blade and the characteristics of the steel. The secondary bevel is much narrower than the primary bevel. It is visible above as a very narrow, shiny, polished strip near the cutting edge of the blade. It is much more refined than the primary bevel by honing and polishing because this narrow surface is what meets the back surface of the blade, which also has been polished. It is the meeting of these two highly refined surfaces that constitutes a sharp edge. For most hand plane blades, an additional important property of the cutting edge is a very shallow curvature across the width, known as camber. This allows the plane to produce a smooth, uninterrupted surface on the wood. The very coarse stone removes steel quickly for rough shaping of the primary bevel and for initial flattening of the back of the blade. The coarse stone then improves these surfaces. For the back of the blade, flattening and polishing then proceed through the intermediate and fine stones. The intermediate stone can be used to start the secondary bevel, which is then worked on the finest stone to produce the final keen edge. When it comes time to sharpen a mildly dulled edge, the secondary bevel can usually be reworked on the intermediate stone or sometimes the coarse stone, and again progressed through to completion on the fine stone. Waterstones are the most popular option. The finest of these can produce magnificent edges. Norton and Bester are examples of good, modestly priced stones. Shapton, Sigma, Naniwa and others make higher end stones. Ceramic stones generally cut faster than aluminum oxide stones and are more resistant to wear, but many factors affect a stone's performance and any stone should be evaluated on its entire merit. Diamond stones are a great option, especially for very coarse and coarse stones. The diamond abrasive is the fastest cutting of all and is extremely durable. Further, the surface of these stones remains permanently flat. An excellent, very practical set of sharpening tools would be very coarse and coarse diamond stones along with intermediate and fine water-stones, as shown below. The latter two are often economically available combined as a two-sided stone, such as an Ohishi 3,000/10,000 stone. DMT DiaSharp and Atoma are outstanding diamond stones. A different approach, the sandpaper method, is favored by many woodworkers who enjoy its non-fussy simplicity and speed. Yet another option, traditional oil stones, artificial for the coarsest grits and natural Arkansas for the intermediate and fine grits, have the advantage of great durability though they do not generally cut as fast or as finely as the best water-stones. It's a method, not a thing. Scary Sharp means using successively finer grits of wet/dry sandpaper and a lubricant to sharpen tools. There is some debate as to the origin of the Scary Sharp system; some believe that it predates World War II, and has been passed down from master to apprentice for generations. Although this now-classic account is not the origin of Scary Sharp, as many believe, it is one of the best, and certainly the most entertaining, endorsements of the practice available. The key to success with the scary sharp system is having the right "equipment." That means having a range of wet/dry sandpaper grits, a honing guide to maintain the correct bevel angle, and a perfectly flat surface to work on. You can collect all of the material yourself, or you can save time by picking up one of Rockler's Scary Sharp kits. They come with everything you need, including high-grade silicon carbide self-adhesive sandpaper, a honing guide, and a guaranteed flat 12" square x 1/4" thick plate glass work surface. There are countless committed disciples of wet sharpening systems like the Tormek and Jet's Slow Speed Wet Sharpener. And in the opinion of many, there's no reason to look further. 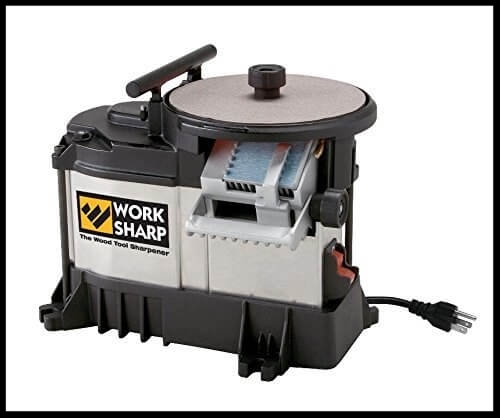 That notwithstanding, we'd like to mention one relative newcomer: the Work Sharp Sharpening System. Available in two models, the Work sharp is (in a sense) a hybrid of the Scary Sharp system and a motorized sharpener; it has a couple of features that you don't see every day. First of all, it's an air cooled system, the convenience of which may appeal to some who think a water cooled system is a hassle. Both Work Sharp models have a unique angled sharpening port leading to the underside of the abrasive disk. The port makes it practically foolproof to sharpen straight chisels and plane irons at the proper bevel angle evenly and repeatably. To make matters even easier, the sharpening port has an integrated, patent-pending ceramic oxide lapping abrasive on its surface. With a few quick strokes, you both sharpen the tool and remove the resultant burr from the cutting edge. If the angled sharpening port is clever and efficient, the system has yet another feature that's downright ingenious: the Work Sharp's proprietary "Edge-Vision" sharpening method. Both Work Sharp models come with special slotted sharpening wheels and corresponding slotted abrasive disks which allow you to sharpen gouges and other non-straight edged tools on the underside of sharpening wheel while you watch the goings-on through the top of the wheel (in much the same way as you can "see through" the blades of a window fan when it's running). How do the WS2000 and WS3000 differ? The WS3000 is the luxury model; it comes with all the capabilities described above and includes few appreciable refinements. The chisel and plane iron port is adjustable in five degree increments from 20 to 35 degrees, giving you more say in choosing a bevel angle, along with the ability put on a quick and easy to re-hone 5 degree micro-bevel. And not that you'll need to worry about it much, the lapping abrasive is replaceable. The WS3000 turns slower than the WS2000 and probably feels a little smoother to operate. It also comes with two tempered glass wheels - the traditional guaranteed-flat substrate for abrasive paper sharpening. The glass wheel are two sided, adding the advantage of being able to keep each of four grinding surfaces loaded up with a different grit for fast changeovers. The Work Sharp WS2000 has one standout feature to separate it from the WS3000: the price. At around $100, we feel confident in saying that it's the most sharpener for the money that you're ever likely to get. If what you want mainly is a tool that quickly and repeatably grinds and hones straight chisels up to 1-5/8" at a perfect 25 degree bevel angle, it's a pretty good bet. And on top of that, you'll get the handy "Edge-Vision" capability and plenty of tool rest-supported freehand grinding surface on top for larger tools. These really complicate sharpening. Sometimes they are a necessary evil. Sometimes they really work magic. But sometimes they are a Royal Pain. I think this way about David Charlesworth’s “Ruler Trick”. This is a terrific – brilliant! – strategy for speeding up the sharpening of old blades – ones with pitted or warped backs – which is what I believe David conceived the method to be. It should not be necessary to use on modern blades, which now either arrive flat or require very little work to become flat. As you will see, the Ruler Trick actually makes sharpening more difficult in the long run. My approach to sharpening keeps re-sharpening in mind. I really do not want to be going back to my waterstones all the time. I also do not want to rely on the steel to be so tough that it holds its edge a longer time – because then there will be an emotional aversion to sharpening the dull blade. If sharpening can take just a few seconds, or hardly be needed at all, then it will not feel intrusive. BD plane blades and all chisels are hollow ground (even – increasingly – my Japanese chisels). Some BD plane steel is best with a primary bevel of about 30 degrees, some will cope with about 25 degrees. I have found that A2 steel improves as it is ground back, so I have not had a problem with edges folding when a 25 degree bevel is used in a LA Jack on the shooting board. It also gets very sharp, certainly sharp enough for my purposes. At one time I considered that 30 degrees would be too high in a paring chisel (my HCS Bergs are at 20 degrees, which is considered by some to be ideal), but the A2 Blue Spruce dovetail chisels get very sharp and hold a good edge at 30 degrees. As do my Iyoroi bench chisels. I prefer to hollow grind on a Tormek (although I also have a half-speed 8″ grinder with a blue 46 grit Norton 3X wheel). The Tormek makes it so much easier to grind to the very edge of the bevel. With so little steel to hone, at this point, one can easily get away with just a 1000 (to flatten the bevel) and 8000 (to smooth the steel) waterstones. The other point is that I hone freehand. I hone directly over the hollow, using the hollow as a reference for stability. This is really easy. Nothing machismo here. Just hold the bevel flat on the hollow and move it until you feel an even wire edge (your guarantee you have not dubbed the edge). It takes about three swipes. That is all. I use a side sharpening technique as this also avoids the danger of dubbing. You end up with a microbevel that is coplanar with the back of the bevel. This is also relevant as you will see shortly. The importance of avoiding a secondary bevel (“grinding at 25 and honing at 30”) is that re-sharpening is made easier. I depend on a strop to maintain the edge between honings. There is an article I put on my website recently on this (http://www.inthewoodshop.com/WoodworkTechniques/Stroppingwithgreenrougeversesdiamondpaste.html). It is extremely difficult to maintain the angle of a microbevel when freehanding on a strop. It is easy enough to create a microbevel on a stone, but returning to it later is a recipe for dubbing. So on to BU planes. Some are concerned that BU plane blades suffer premature dulling as a result of a larger wear bevel – and I am not refuting that this occurs or that it causes deterioration of a plane’s performance. However I do not experience any issues myself, and this may be due to my blade maintenance strategy. Where BU blades differ from BD plane blades is that the cutting angle is a combination of the bed and bevel angles. Since I use steep cutting angles on the BU smoothers and want to add a little camber, it is not appropriate to attempt to hollow or flat grind these at that angle. That is why I came up with a cambering strategy for BU blades in this article: http://www.inthewoodshop.com/WoodworkTechniques/TheSecretToCamberinBUPlaneBlades.html. I fought against using a honing guide for a long while, but eventually just accepted that BU planes must be done this way. While the bevel angle is relatively unimportant on a BD plane blade, the accuracy of it is all important on a BU plane blade. This is what turns so many older woodworkers off BU planes. However their performance is just so good that I will put up with the extra rigour of a guide. The problem with using a secondary/microbevel on the BU blade is that it restricts stropping for edge maintenance. Since you cannot get away without using a microbevel, stropping can only take place on the back of the blade. So – full circle – you cannot use the Ruler Trick as it would prevent stropping. Of course, ignore all the above if you do not plan to strop. My sharpening system is built around stropping. The act of stropping the back of the BU blade is what removes the wear bevel. I simply do not allow it to get to the point where it might intrude (I empasize “might” since there are many BU plane users who do not experience in practice what is stated in theory).